December is a month of reflection for many of us: a collection of experiences, novelties and new means to expand Asian Trails’ name across the globe. With another year behind us I can look back on 2018 with pride and gratitude, and feeling truly honoured working in such a diverse industry with an excellent team and customers who are keen to sell our Asia in the most creative way. May 2019 be a blessed one for all our valued customers filled with new challenges, opportunities and exciting moments when blazing new paths in travel is your New Year resolution! 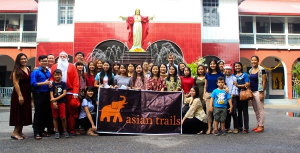 For years I have been visiting Yangon’s Little Sisters of the Poor Home for the Aged, and it has turned into one of my favourite places in Asia to celebrate Christmas with some of the less fortunate in Myanmar. The Sisters of this retirement home are working tirelessly to give people in need, and especially those of advanced age, a safe haven to spend the final years of their lives. An annual event that warms the hearts of these senior citizens and that of mine and our great team is carolling Christmas Day away. My CEO story reveals why such places are more than just a home for the elderly.